SYDNEY, Australia – March 19, 2007 – Altium Limited (ASX: ALU) today announced the addition of a raft of new productivity-enhancing features for its Altium Designer unified electronics development system to assist engineers with handling high-speed design issues resulting from the fast changing nature of today’s mainstream board-level design and its convergence with the wider electronics development process. Dispelling the mystique that typically surrounds high-speed design issues that is often used to justify the inflated cost of high-speed, high-density board design features, Altium is making these capabilities accessible and useable by all designers working at the physical level today. With the latest electronic components offering a wide range of fast-switching I/O and dense packaging options, particularly in the latest generation programmable devices, Altium has focused recent developments for the latest version of its Altium Designer system – Altium Designer 6 – to include a wide range of highlevel interactive and automated tools designed to allow all engineers to easily assess, manage and troubleshoot signal integrity issues. Altium Designer now adds interactive net length tuning, enhanced board layer navigation and more powerful polygon area fill placement modes to its arsenal of high-speed, highdensity capabilities that already includes interactive differential pair routing, impedance-controlled routing, built-in signal integrity analysis and termination matching, automatic BGA escape routing, automatic FPGA board-level pin optimization and full PCB-FPGA bi-directional design synchronization. These new and enhanced features form part of Altium Designer’s advanced yet easy-to-use suite of capabilities aimed to reduce overall design time for high-speed, high-density PCBs, to increase the ease and efficiency for working with high-speed digital signals and to harness the full power of the latest electronic devices and technologies, such as high-capacity programmable logic, that have made their way onto everyday board designs. Altium Designer’s intelligent interactive routing system has been enhanced with the addition of a new interactive length tuning tool specifically for high-speed designs. This new feature allows designers to quickly optimize and control net lengths by dynamically inserting ‘accordion’ segments into a track. Tuning can be manual or rules-driven, and designers can select from a number of amplitude styles available in the system. 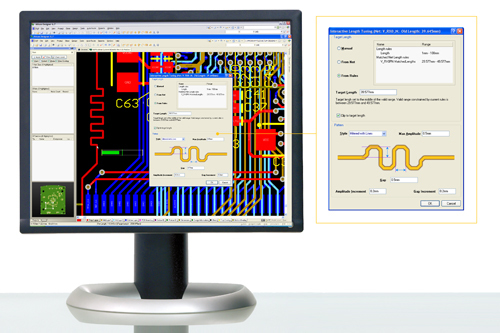 This feature combines seamlessly with impedance-controlled, differential pair and multi-trace routing capabilities to give Altium Designer users a comprehensive interactive solution tuned for the high-speed, high-density board design projects that are being significantly impacted by modern day programmable devices. These board-level system enhancements, and more, are now available with the latest software update for Altium Designer 6 – Altium Designer 6.7. All Altium Designer 6 license holders can download this update for free at http://www.altium.com/Community/Support/SoftwareUpdates/. Altium Designer 6 is available for purchase through Altium’s sales and support centers worldwide. For information on pricing and flexible product licensing options, customers should contact their local Altium sales and support center. Details can be found at www.altium.com/contact-us.